The ancient Greeks and Romans had a sense of style and grandeur that has barely been matched in the subsequent millennia. Their temples, tombs and villas were often adorned with elaborate mosaics depicting figurative scenes or intricate abstract patterns. 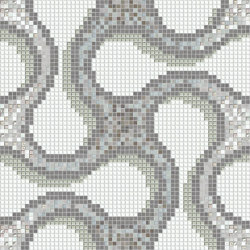 This iconic decorative technique has endured and thrived ever since, and has found a new champion in Italian firm Mosaico+, which pioneers innovative mosaic techniques and designs from its headquarters in Italy’s Emilia-Romagna region. 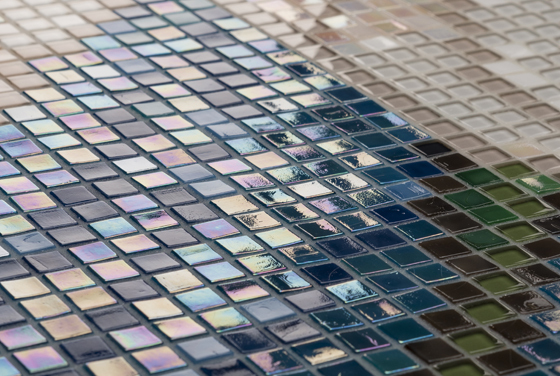 Mosaico+ was founded in 2008 with the aim of proposing a new mosaic concept in the field of architecture, design and contract interiors. The company combines modern processes and technologies with the knowledge and artisanal expertise available in Emilia-Romagna, which is renowned as one of the world’s most important ceramic districts. Mosaico+ is also part of the Mapei group, and is therefore able to draw on the technical and organisational support of this world leader in chemical adhesives. 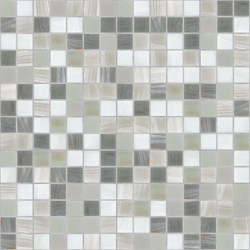 The range of products offered by Mosaico+ ensures there is a suitable solution to fit with any style of decorating scheme, and walls of any size. 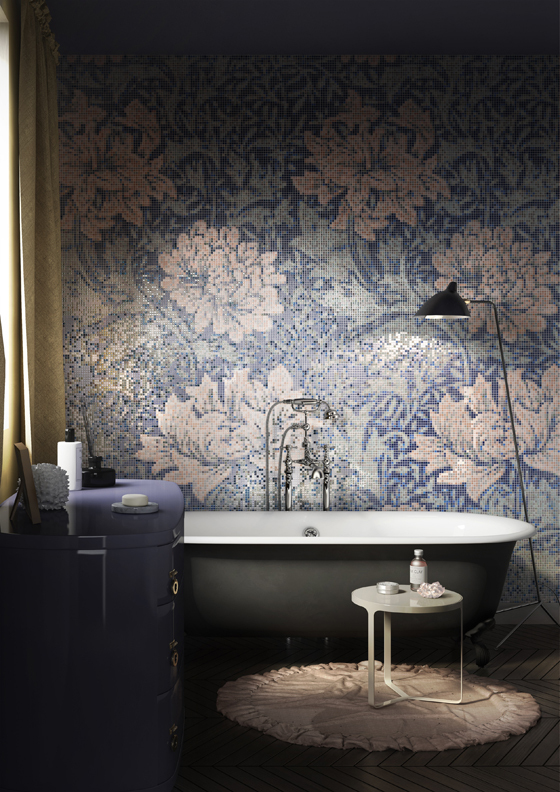 All the tiles of the various product lines can be specified on modular sheets and used to compose personalised compositions or motifs. 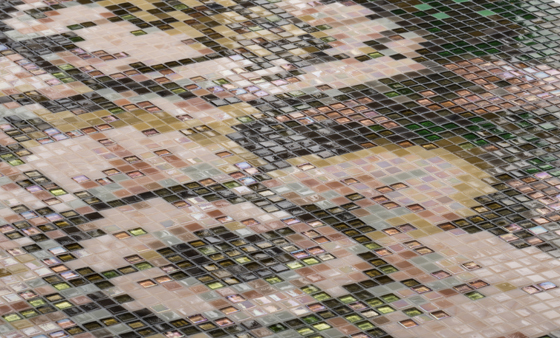 Using computerised processes and the experience of the dedicated Mosaico+ Projects Division, the products can also be tailored to the specific requirements of interior designers who come to the company for guidance and technical support. 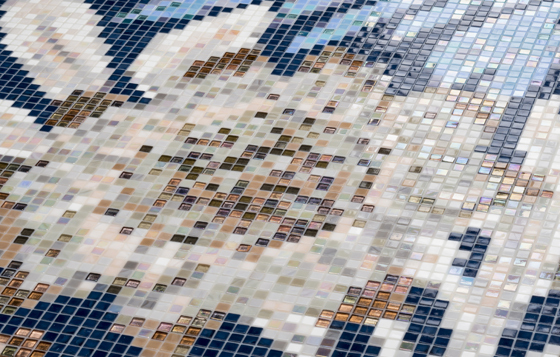 Mosaico+’s catalogue of innovative mosaic designs is an excellent starting point for designers looking to explore the possibilities of contemporary mosaics. 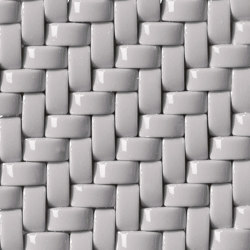 Products such as the three-dimensional Crono tiles by Giugiaro Design Project demonstrate the firm’s technical capabilities, while Francesco Lucchese’s Dialoghi collection allows customers to choose from various types of wood, stone, glass and metal tesserae when composing their designs – thereby demonstrating that mosaics need not be limited to the qualities of traditional ceramic tiles. 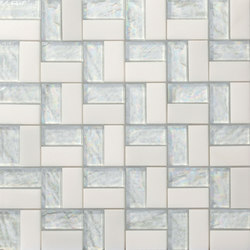 The latest innovation from Mosaico+ is the Ornamental collection, which goes beyond the simple geometric motifs associated with modern mosaic to offer detailed shapes and patterns inspired by nature. 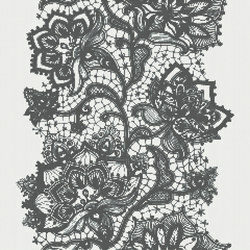 Images of plants and flowers are translated into intricate designs that celebrate their dynamic, organic forms. 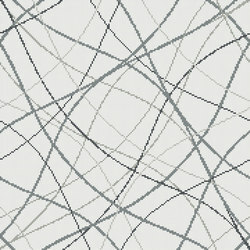 The abstracted patterns combine matte and glossy tesserae to produce surfaces with an eye-catching richness of tone and texture. 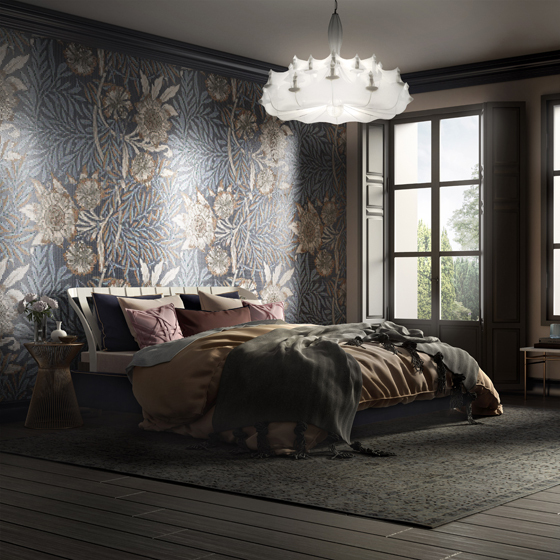 The repeat patterns developed for the Ornamental collection are influenced by the ornate tapestries, wallpapers, carpets and curtains found in stately homes. 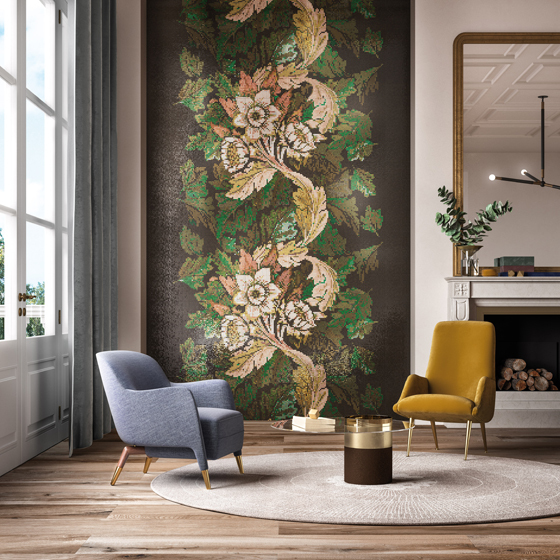 This traditional decorative style is updated through the application of a palette of contrasting colours that creates a bold statement for use in modern interiors. 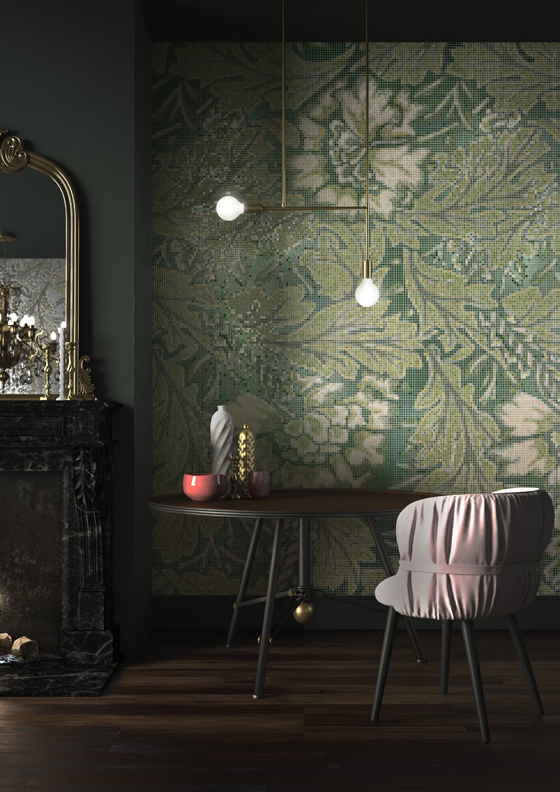 “A new expressive language is created that exalts the curves inspired by the sinuous shapes of the plant world and combines them with geometric and symbolic elements and references, for truly astonishing decorative effects,” adds Nencioni.